Last week I had the privilege of guest blogging on another site. This week I get to host by own guest blogger. I think you will like her – in fact, you may not be able to tell us apart. My twin sister Kristen Koepf Ray had some rather astute observations after attending the funeral of one of the police officers killed here in Dallas on July 7. The message she got was very timely for our society in general and the global church in particular. I asked her to share it here. Maybe you will learn something too. A few weeks ago, I was honored to attend the funeral service for Senior Corporal Lorne Ahrens, one of the Dallas police officers killed in the line of duty on July 7th during a protest demonstration. As someone who has lived and/or worked in the Dallas area for the last 18 years, I was deeply saddened and affected by this act of violence. I did not know Officer Ahrens personally. The funeral was held at the church where I work, so I decided to attend to pay my respects for this man who gave his life in protection of others. The 7,000 seat sanctuary was almost full – and a vast majority of those people were uniformed police officers from all over the states. My co-workers and I met police officers from North Carolina, Illinois, California, Washington – many who took a couple of days off and drove just to be there to pay their respects. I watched in awe as the Freedom Guard, the police cars, and the police motorcycles lined up and drove out in the processional to the cemetery. News anchors said it was likely the longest funeral procession in Dallas history. As I watched the pageantry of it all, I thought to myself that this was a bond that those of us not in police service could never understand. A bond that compelled officers to drive across the country for someone they didn’t know. Since then, I have thought about that moment – and I can’t shake another thought. As Christians, why don’t we have and understand that kind of bond? Our bond isn’t based on putting our life on the line for others. Our common bond is the love of Jesus Christ who lost HIS life to save all of us. That should be the strongest bond of all! Do we feel this kind of bond with other believers? Do we show up for each other? Not just in death, but in life? Some Christians and some churches are good at this – being there for each other, living life together. Some are not. There are a lot of believers that I love. There are friends, family, church members, and co-workers that I pray for, spend time with, and/or check in with on a frequent basis. There are people in my life that I would drop everything and show up for if they needed me. No matter how far I had to go. Most of the time. Then there are those times that I am so wrapped up in myself and what is going on in my little world that I don’t even notice what is going on in the life of others. The bond in Christ falls prey to my own busyness, trials, distractions… I can give it a lot of different names, but it all boils down to selfishness. 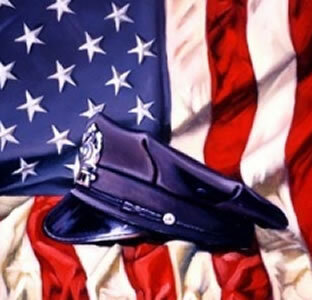 I am so thankful for the sacrifice of our men and women in blue. And I am thankful for this reminder of what our bond should look like as brothers and sisters in Christ. Loving each other and showing up for each other selflessly – could there be any better witness to a searching world? Lord, forgive me of my selfishness and help me show the lost your love by loving your children better.